The Independent ran a story today about a drug bust by the Santa Barbara Sheriff's Department that yielded a ton of cash and 1.2 pounds of cocaine. The Sheriff's Department was kind enough to send over pictures of this bounty — Exhibit A and Exhibit B, if you will. 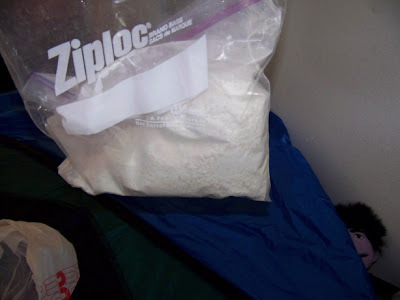 Below is the baggy of coke, which I've never seen in such quantities before and which looks reminds me of the giant ziplock back my apartment uses to store powdered laundry detergent. But that's not all the photo depicts. See in the bottom right corner? 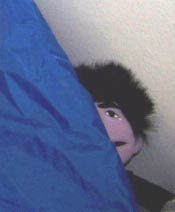 Graduated intern Adrian pointed out what would appear to be a badly coiffed doll of Sesame Street's Count von Count, leering ominously from beneath the bed. This may not prove that Bert is evil, but it certainly casts a shadow on the entire Muppet clan.